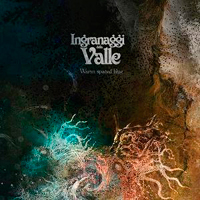 “Warm Spaced Blue” is the second album of the Italian progressive rock band Ingranaggi Della Valle. The album is released by the Italian Black Widow Records label. Maybe you know their debut album “In Hoc Signo” that was a tribute to Italian progressive music of the seventies. With their new album “Warm Spaced Blue” the band tried to maintain their stylistic unity without setting boundaries in the arrangement by choosing from a wide range of instruments. From the classical Mellotron's, Moog's, Hammond, guitars and violin to the Roland drum machines, Akai MPC and Kaoss Pad. While maintaining a jazz approach for writing harmonies the band acquired a big structured rock sound and introduced English as the singing language. On “Warm Spaced Blue” you can find only six tracks. The majority of this album is reserved for the suite “Call For Cthulhu” (more than 20 minutes) which is divided into the parts “Orbison”, “Through The Stars” and “Promise”. In between those three tracks you can find the songs “Inntal”, “Lada Nina” and “Ayida Wedo”. The opening of the first part “Orison” (9:24) of the “Call For Cthulhu” suite has an experimental character by the use of modern electronics. After this intro you will hear the first Mellotron flutes and of course the violin. Immediately I know that this is a very special album and band. This is true progressive rock music and I had to think of bands like Anglagard, After Crying and Isildurs Bane. Not because their music is sounding like one of those bands but because this band is also in the premiership of progressive rock. Well maybe the first Mellotron and violin sounds reminds me a little bit of the Swedish band Isildurs Bane. What a great opener. The second track “Inntal” (10:36) has some influences of the Canterbury scene and some of the Mellotron strings reminds me of Anekdoten. The jazz approach of the harmonies is more Anglagard or Isildurs Bane alike. But I would like to emphasize that Ingranaggi Della Valle has an unique own musical style. The slow second part “Through The Stars” (3:16) of the “Call For Cthulhu” suite is dark and mysterious and reminds me more of the Belgian RIO band Univers Zero. “Lady Niva” is more up-tempo and the first vocal parts are sung in a way that reminds me of the American band Echolyn. It is a great song with diversity and a delicious last part in which the tension of the music is slowly building up towards a kind of climax. The brilliant “Ayida Wedo” (5:55) has the dark RIO atmosphere of a band like Univers Zero. The album closes with the last part “Promise” (11:48) of the “Call For Cthulhu” suite. Delicious dark Mellotron waves, violin and a great flute solo played by guest Paolo Lucini. I love the dark and ominous character of the music. After a great climax the album ends as it began ... with an electronic and experimental part. Wow, I am a little bit caught off guard here ... what a fantastic album! For sure one of the best progressive albums I have heard this year! If you like real progressive rock with a dark atmosphere and if you are into keyboard (Mellotron) dominated Prog this is your album. Highly original music with influences from jazz (Canterbury scene) and the dark side of RIO (Rock In Opposition). Personally I think that lovers of bands like Anglagard, Anekdoten and Isildurs Bane have to check this album out. Highly recommended by progVisions!